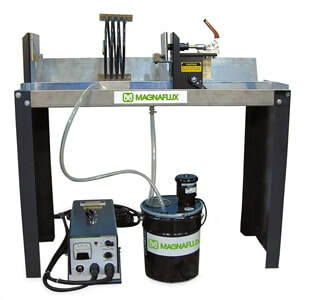 The Mag Kit is a sectional magnetic particle testing system for low volume non-destructive testers with the benefits of an operational magnetic wet bench but without the investment of a production-level mag bench. Using a P-series portable power pack as a power supply, the Mag Kit is an economical, easy to operate alternative to more expensive, higher volume bench units when volume processing is not required. It provides the same level of inspection dependability in a lower volume, lower cost equipment package. The Mag Kit includes a durable, stainless steel bench, headstock and tailstock and an 11 in / 28 cm solenoid coil, P-Series current generator need to be purchased separately. Optional add-ons include a recirculating Mag Kit Spray System with 5 gal / 18.9 L capacity to apply magnetic particle bath pump and a Mag Kit Hood to enclose the Mag Kit bench for darkened fluorescent magnetic particle inspections.